Episode 38: Pikachu, Where are You!? The Halloween-themed episode 38 is out now. Read it here. When Ash, Brock, and Brenda arrive at Starside City for Brenda’s contest, they discover that a giant Pokémon known as the Wraith is stealing coordinators’ Pokémon. Now it’s up to them and a special Officer Jenny to solve this mystery. The point of this episode was to show off the Cycling Road and bikes, as this is the episode that takes place in the location of the Cycling Road in the games. I put two jokes about bikes into this episode. The first was Brenda mentioning she wanted to keep her bike at home so a Pokémon wouldn’t damage it. Ash then says that was probably a good idea. This is a joke on the fact that Misty, May, and Dawn all had their bikes destroyed by Pikachu in a running gag. If Brenda had brought her bike, it’s very likely Pikachu would have destroyed it as well. The other joke was in the bike shop when Ash is outraged at the price of a bike. One kind of ridiculous thing in Pokémon is the fact that you can buy a Pokéball, a miracle of modern technology, for 200 Pokédollars, but a bike costs more money than you could ever hold at one time. I thought it would be funny to address that oddity. Episode 38 is out and can be read here. One final obstacle remains before Ash, Brock, and Brenda can make it to Starside City, the Cycling Road. Without bikes, they have no way of crossing. Luckily for them, there’s a bike race that will let them use bikes if they enter. But now they must help a new friend win this race. Also, on a positive note, this should hopefully end the episode drought. At this point, I have begun to write episodes full time again. I may even write them faster than I used to. I will admit that it was a bit of a mistake to have Helioptile prominently featured two episodes in a row. I had planned this episode first, and then I when I was planning the episode before it I decided that Will’s newest Pokémon should be a Light-Type. I didn’t want to use any of the Light-Types already made for Cosmic Quest, as they’ve been a bit over-used, and I didn’t want to introduce a new one yet. Then I started thinking about old Pokémon that became Light-Types. Helioptile came straight to mind and I thought it was a perfect fit. I figured I could justify it by having Will have caught it nearby, as in the location of the following episode, and it kind of worked, but I wouldn’t say it was perfect. As far as this episode itself went, I knew that I wanted it to show off the sun aspect of Turcell/Turtsol, and I thought it would be fun to pair it up with Helioptile and Helioisk, the other solar powered Pokémon. One ironic point was that my original idea was to have Ash and Turcell try to teach Helioisk how to use Sunny Day, Turcell wasn’t going to learn it all. Then I realized that Helioptile and Helioisk can’t learn Sunny Day, not even through TMs. (Which is completely ridiculuous if you ask me, as they’re more associated with the sun than almost any other Pokémon that can learn Sunny Day. To make matters worse, they don’t even learn Solar Beam through TM. Being solar powered Pokémon, Solar Beam is like the definition of them, and should be a signature move of theirs. Very silly and senseless move on Game Freak’s part.) I considered just not worrying about it and using the excuse that in Luna, Terra, and Sol Version they can learn Sunny Day, but decided that people who don’t visit this website might think that I hadn’t done my research. So in the end, Turtsol got two new moves with its evolution instead of one. Trivia: Myoken is the first event-exclusive Legendary Pokémon to be announced from the Tenno Region. It is meant to fill the same niche occupied by Mew, Celebi, Jirachi, Shaymin, Victini, and Diancie. It’s name is derived from the Japanese goddess of the North Star of the same name. The four arms of and two orbs held by Myoken are also inspired by the same goddess, as she was depicted with four arms and as holding the sun and moon discs. As an event-exclusive Legendary, the only way to obtain Myoken is either through a direct download event or via a special item known as the Polar Pass, only given away at a specific event. Once the Polar Pass is obtained, you can take it to the captain of the hover-boat, the S.S. Galaxy (the main transport between Horizoport City and Kanaveral City, as well as the only way to get to the Pokémon League). Once the Polar Pass is shown to him, the captain will recount to you a story of when he was just a young cabin boy and his ship got lost at sea. Myoken appeared to guide the ship home. He tells you that that Polar Pass proves that you are worthy of meeting Myoken, so he’ll bring you Myoken’s home, the star-shaped island known as Far North Isle. The island is mostly covered in frost and snow, but if you travel there at night, you will be treated to a magnificent view of the stars. The only thing on this island is Myoken, which you can challenge to battle and try to capture as you want. 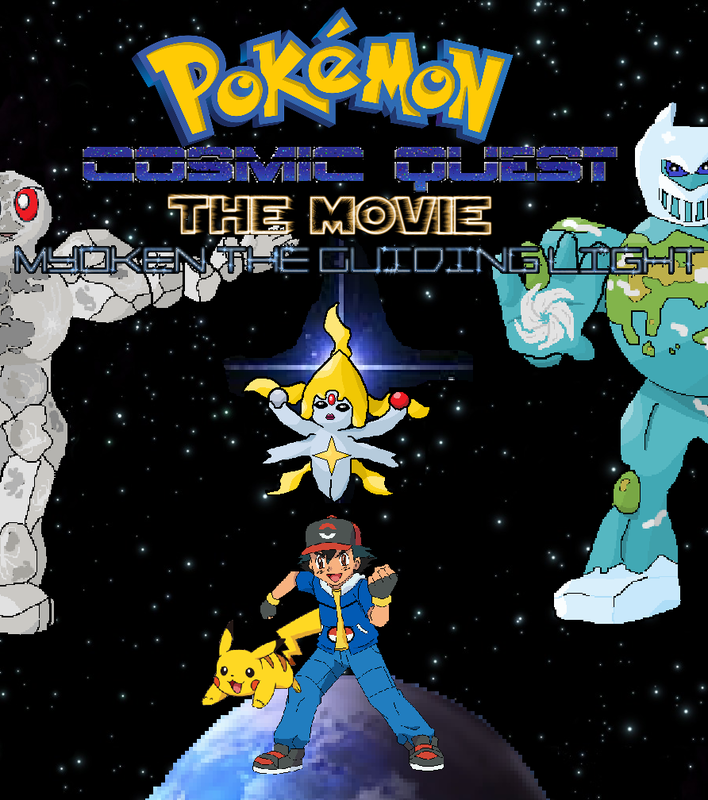 The wait is over, Myoken the Guiding Light, the first Cosmic Quest movie is here at last! Make sure you read it here. Join Ash, Brock, and Brenda in an out-of-this-world adventure! Myoken, Legendary Pokémon and embodiment of the North Star, has been captured and used for malicious purposes by an evil scientist. Now it’s up to Ash and friends to join forces with Myoken the Guiding Light, and find the secret of Myoken’s past as well as the key to saving the very world itself. Also, the Tenno Pokédex and Attackdex has been updated with the contents of the movie. Description: Upon evolution, Turtsol’s solar panels become much more efficient, allowing to gather even more energy from the sun. It has also integrated the metal from its solar panels into its shell, allowing it to become a much better defensive mechanism. Trivia: A Turcell can live without its solar panels, as most of its energy is still derived from traditional food at that stage. But once it evolves into Turtsol, it will be unable to function if its panels are removed, as it relies on the sun for most of its energy. A Turtsol will quickly die without its panels.